Do you have an author crush? You know an author you just adore and can't get enough of their books... I have an author crush on Tammi Sauer. 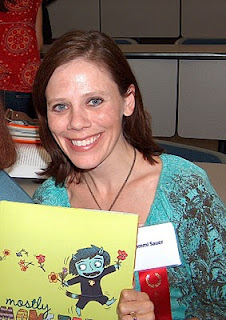 (blushes) I met her at the SCBWI conference in Kansas City a few years ago. I took a class from her and was bowled over by the wealth of information she shared with us. If you missed that post, please feel free to check it out. So when Tammi asked me if I would be interested in doing a book review for ME WANT PET I was beside myself. I had already pre-ordered ME WANT PET, so that is good news for you because I will be giving a copy of this amazing hardback picture book! Tammi is also doing a book giveaway .and.... she is giving away some wicked cool second and third place prizes too. Cave Boy goes in search of the perfect prehistoric pet. If you ever wanted a pet and were told no, this is the book for you! ME WANT PET is a delightful story, that is easy and fun to read and kiddos will want to read it over and over again. Cave Boy is such a relate-able character. It's full of fun dialogue...OOGA! 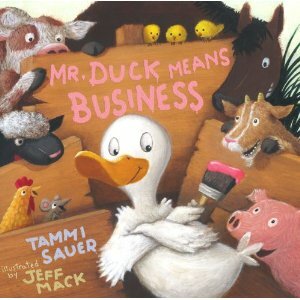 If you are a picture book writer, I suggest you check out Tammi's books. I've been studying them to improve my writing. You can check out all of Tammi's books and upcoming books here. You can purchase ME WANT PET here and here. Tammi's book Mostly Monsterly is featured on Cheerios boxes right now! So hurry out and buy a box of Cheerios! Mostly Monsterly is an amazing book! If you would like to enter my giveaway, please be a follower and use "OOGA" in your comments. I will announce the winner on my March 22nd post. Do you have an author crush??? I have so many author obsessions! LOL!! Awww Me Want Pet sounds so utterly utterly adorable! Yay!! This sounds like a fun book. Congrats on meeting your author crush. That's always fun. I let someone who is a picture book writer or has younger kids win this. You're lucky to have met Tammi in person! She's such an amazing and prolific writer, and has a heart of gold. Nice to meet you via this Blog Tour, Sharon :)! Tammi's books rock!! Can't wait to read ME WANT PET! Wow! That is so cool! She seems so nice. She sure likes like a cool one fur sure! I love your enthusiasm for this book and author, Sharon! Sharon, I love your review of ME WANT PET! It sounds like a wonderful book and I'll be looking forward to reading it at the library. Orange is such a great Dr. Suess-like color for the cover. I can see this one quickly becoming a favorite. Oh, so fun! I do want a pet and my landlord said 'no'. I can relate! hi! wow you know i looooove animals even those prehistoric ones. for sure i could loooove this book. OOGA MOOGA me into the drawing. I had not heard of Tammis' book, ME WANT PET! Sound wonderful! That looks like such a cute book! I've seen her other books and they look charming. I was delighted to meet Rosemary Wells when my kids were younger - her books have been some of our favorites. Sounds like a fun book. I'm sure my soon to be 4 yr old will love it. OOGA !!! I am an old timer and my favorite authors are writers from old times Among the books I read to my kids I like Beverly Cleary's books and of course Roald Dahl. Me Want Pet sounds like a fantastic book. Ooga. If I say Ooga Booga, is that extra points? Oh my gosh, I am getting that book! I LOVE that cover! OOGA, sounds like an awesome picture book, loads of fun reading over and over again. Great review, Sharon. Ha! Kids will relate to this one! Definitely have author crush! Love Tammi's books! I have this huge crush on this um 'author' who I have a full sized photo of in my hallway. Oops, got that wrong, it's me staring at myself in my full-length mirror! Of course, I would never call a 'pet' a pet. Me want new cherished family member with four legs and bad breath. Hi Sharon .. children just love stories with lots of imagination they can tap into - sounds like Tammi's books are a great read. Author crush - well no I can't think .. I just read all sorts .. I have an author crush...and an agent crush. Does that count! Um, I have too many author crushes! This book look hilarious. I bet my son would love it. Oh my goodness, how cute is that book??? Hmmm, author crushes...probably John Green. Or Andrew Smith. Or Jay Asher. Is it a coincidence they're all men? I met her at the LA conference! She was so sweet. This new book sounds great!! Btw, my author crush is Matt de la Pena and I get to meet him in April (I hope) at the SCBWI Western Washington conference! Yippee!! This book sounds adorable. And your review is really sweet too! This book sounds wonderful! Just right for my little one! Ooga! Tammi's book sounds like so much fun! A few of my favorite authors: Suzanne Selfors, Meg Cabot, and E. Lockhart! I remember meeting her, too. She is great. I'll have to check out her newest book. I do have a couple author's I die for. Margaret Peterson Haddix, Mary Downing Hahn, and Lois Lowry. I'll read just about anything they write. sounds like a book I have to get! I think my grandkids would enjoy it, and I'd love to be entered into the drawing. Thanks for offering it and sharing your review, Sharon! Just the title alone makes me smile - sounds great! I think I also have author crushes! Why does the title 'Me Want Pet' sound like a familiar line from my childhood? This seems to be so sweet!! Lovely pics too! I have an author crush on Patrick Rothfuss but Kendare Blake is showing some though competition to the old bearded bloke. That book looks so fun! Thanks for sharing. :o) Ooga! How are you? Sorry I've been MIA for so long. You've been on my mind and I've been wishing you well. We'll have to talk soon! I have to get my daughter this. She wants a cat, and reminds us that every day. Ooga booga! How freaking awesome is that to do a review of your author crush's book?! So very cool! Its great to meet Tammi and good luck to her and Me Want Pet! No author crush for me. I'm happily married. I have many author crushes. And Tammi's books look so cute. Thanks for the review. Ooga, Yall! My author's crush would have to be Nancy Van Laan. I along with the kids in my literacy program loooove 'Possum Come a Knockin'! This would be a really neat book to read to them. thank for the opportunity to add a new book to our reading session. Ooga! Me want book! Me have author crush on Maggie Stiefvater. Me no spell her name good. Me follow you blog. Ooga Ooga!! Me have lots of crushes and twin 4year old nephews that would love to run around saying ooga ooga!!! OOGA! LOL My sons would love this book! I have a ton of author crushes, including Elana Johnson. I have many author crushes and Tammi is one of them. Her books are just adorable. Don't put me in the drawing as I have already won a copy of the book :•) Thanks the review....it makes me even more excited to receive my copy of Me Want Pet. OOGA! My kids have wanted pets for a long time! Her books sound adorable! I'm going to have to check them out.